Additional research provided by A. J. Bullard, David A. Norris, Karl Rohr, Jean Snow, David Southern, and Maurice C. York. See also: Biltmore Forest School; Logging; Pine Trees; State Parks. Forest protection has been undertaken throughout the state in an attempt to prevent and control fires, insects, and disease. Fires, for example, are important ecosystem processes in releasing nitrogen and producing other chemical reactions; consuming debris; and heating, altering, and refreshing the landscape. But fires can also become disastrous for both people and the environment. Some of the most devastating fires have had causes ranging from natural occurrences such as lightning and drought to human accident. The destructive power of forest fires may be seen in the data for a few selected years: 546,000 acres of forest burned in the state in 1879; 1.5 million to 2 million acres burned in 1894; over 1 million acres burned in 1941; over 600,000 acres burned in 1955 (during one of the largest single fires on record in North Carolina); and 23,000 acres burned in Pender County over 10 days in May 1986. Other problems, perhaps not given the same media attention as fires, may have long-ranging, destructive effects on North Carolina forests. Pest outbreaks, including Dutch elm disease, chestnut blights, and gypsy moths, are often unpredictable and cyclic. Forest losses from Hurricane Floyd (September 1999) were estimated by the North Carolina Department of Crime Control and Public Safety's Division of Emergency Management at more than $89 million. On 28 June 2000 Governor James B. Hunt signed legislation that encouraged new public-private partnerships to preserve 1 million acres of farmland, forests, wetlands, and other undeveloped land in the state over the next 10 years. The U.S. Forest Service reported in mid-2000 that trees in Durham and Wake Counties are disappearing faster than in almost any other county in the Southeast. Durham developers are now encouraged to leave some stands of trees intact, in response to a 1999 resource protection ordinance adopted by a group of concerned architects, environmentalists, politicians, and builders. Various organizations and government initiatives have advocated forest preservation through the years. For instance, for many years the entities that oversee national and state forests in North Carolina and firms in the forest products industry have been practicing forest management techniques such as tree farming, a systematic program of conservation and reforestation designed to ensure continuous commercial production of timber. Many small landowners also use tree farming techniques in an effort to maintain and replenish the state's forests. In addition, the North Carolina Forestry Association consistently works to improve the "health and productivity" of the state's forests. Orange County's Environment and Resource Conservation Department uses a mix of county and state funds and grants to acquire land. Its Land Legacy Program was launched in 2000 with the purchase of 63 acres in Duke Forest near the Eno River and McGowan Creek, west of Hillsborough. Urban forestry was given another boost when the state Department of Environment and Natural Resources awarded a "Tree City USA" designation to 48 cities and towns across the state. By the early 2000s nearly 62 percent (about 19.9 million acres) of North Carolina was forested, down from 64 percent in 1950 but more than double the 30 percent in the early 1900s-the high point of agriculture in the state. The state's forests slowly continue to repair the enormous soil damage caused by primitive agriculture. In terms of ownership, about 73 percent of the forestland is owned by 300,000 individuals (small farmers) or organizations (such as the Nature Conservancy) not associated with the forest products industry. Eleven percent is owned by the forest products industry, and 16 percent is owned by various levels of government, including four national forests (Croatan, Nantahala, Pisgah, and Uwharrie), six state forests (Clemmons, Holmes, Jordan Lake, Rendezvous Mountain, Turnbull Creek, and Tuttle), and a number of city and county recreation areas with forested acreage. Chris Bolgiano, The Appalachian Forest: A Search for Roots and Renewal (1998). William Chambers Coker and Henry Roland Totten, Trees of the Southeastern States, Including Virginia, North Carolina, South Carolina, Georgia, and Northern Florida (1934). O. C. Goodwin, Eight Decades of Forestry Firsts: A History of Forestry in North Carolina, 1889-1969 (1969). J. S. Holmes and North Carolina Department of Environment, Health and Natural Resources, Division of Forest Resources, Common Forest Trees of North Carolina: How to Know Them (1995). 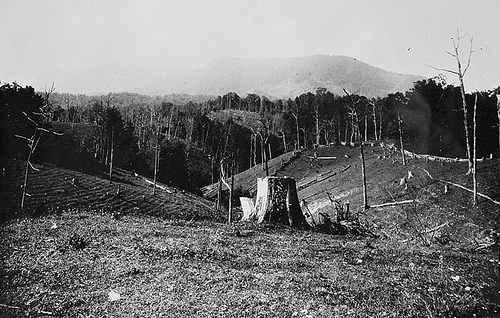 First Views of Humpback, sept 19, 1908, near old corner tree; Bicknell Photograph Collection, North Carolina State Archives, call #: PhC8_78, Raleigh, NC. Available from http://www.flickr.com/photos/north-carolina-state-archives/2744017119/ (accessed September 12, 2012). 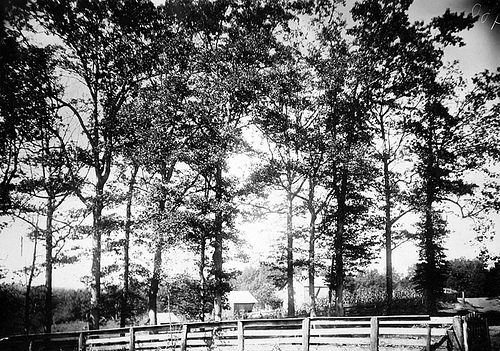 Oaks in front of Penland's- Crockett's in distance Oct 1, 1910; Frank W. Bicknell Photograph Collection, PhC.8, North Carolina State Archives, call #: PhC8_400, Raleigh, NC. Available from http://www.flickr.com/photos/north-carolina-state-archives/2744979892/ (accessed September 12, 2012).